The Hawaii Venture Capital Association awarded its 2012 HVCA Deal of the Year to Darren Kimura, CEO of Sopogy, maker of concentrated thermal solar collectors. In addition five local entrepreneurs were acknowledged in various categories with the HVCA Entrepreneur of the Year award. The Young Entrepreneur award went to Scott Mercer of Volta Industries, makers of advertising driven free electric vehicle charging stations. Dan Leuck, co-founder of CONTIX and CEO and founder of Ikayzo won the Software Entrepreneur award. Ken Berkun, founder of Labels That Talk won the Inventor Entrepreneur award for his patented invention, Soundpaper. Winner of the Socially Responsible Entrepreneur of the Year award is Elyse Petersen, founder of Tealet, a social enterprise that connects tea drinkers with small tea growers around the world. David Watumull, co-founder of CARDAX Pharmaceuticals and former CEO of Hawaii Biotech was acknowledged for his many years of devoted entrepreneurship in biotech as the 2012 Legacy Entrepreneur. “These entrepreneurs are local heroes and role models. They have worked long hard days, made personal sacrifices and taken extreme risks that prove there are people in Hawaii that have what it takes to build great companies,” said Bill Spencer, President of the Hawaii Venture Capital Association. The Hawaii Venture Capital Association was founded in 1988 to promote venture capital formation, entrepreneurship and economic diversification in Hawaii. Spencer has served as its president since 1999. This is HVCA’s 12th annual Deal of the Year and 5th annual Entrepreneur of the Year award ceremony. Sopogy has pioneered the concept of MicroCSP(tm) using its mirrored concentrating solar thermal solar collectors to create high quality thermal heat. This heat is used in the industrial process and as solar steam. The International Energy Agency has estimated that only 17% of final energy consumption is for electricity while 47% of final energy consumption is in the generation of thermal energy. 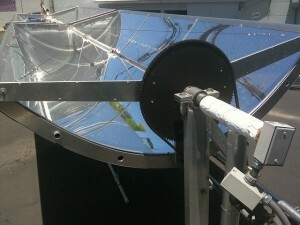 Sopogy’s technologies are poised to capture the thermal energy market by harnessing the power of the sun. Sopogy’s thermal energy is the fuel for stable, renewable process heat and solar steam. Please visit www.sopogy.com for more information. August 2010. He and business partner Christopher Ching developed Volta’s proprietary revenue model based on public EV charging stations, and successfully launched this business model on Oahu in 2012, quickly expanding the number of EV charging stations throughout the island. Today Mercer is leading Volta’s strategic expansion to ten cities on both U.S. coasts by heading up efforts to secure capital from outside investors. In addition, Mercer is working to establish partnerships both regionally in Hawaii and nationally. Ken founded Labels That Talk in 2006 and has invented and patented its core technology, Soundpaper that lets you record sound on everything from labels to greeting cards. He has extensive background in high tech companies, both as an individual contributor and in management. Prior to Labels That Talk, he was a co-founder of Singingfish, the world’s first audio/video search engine (now owned by AOL). Ken was responsible for Singingfish’s business plan and strategy. Elyse worked as a Global Tea Ambassador in Wazuka, Kyoto, Japan with the International Tea Farms Alliance. Through her time in Japan she made many connections with tea farmers and was inspired by the passion farmers had for their tea. She is now the founder of Tealet, a social enterprise that connects drinkers with tea growers around the world. Mr. Watamull has more than twenty years experience as a biotechnology industry executive, analyst, and investment banker. He is cofounder of Cardax Pharmaceuticals and co-inventor of the Cardax technology with 14 U.S. and global patents to his name. Cardax has developed and patented a novel class of anti-inflammatory compounds with the potency of steroids or NSAIDS such as aspirin or Celebrex but with the safety of food. He has raised more than $12 million for Cardax since it spun out from Hawaii Biotech in May of 2006. As CEO of Hawaii Biotech, he led efforts that resulted in more than $25 million in investor financing and $30 million in federal grant and contract funding.